Thanks for your support throughout 2018! With gratitude, we give you this overview of 2018. It's Fall! And while we may love the Fall weather, I can't help by share the highlight of our summer: The Empowered Uth program kicked-off with a small group of Philly-area teenagers with tremendous support from YOU, our individual donors, volunteers, and our program sponsors: Black Women Give, Legacy of Love, Our House Culture Center, and Jennifer Strickland Photography. From June through September, the young ladies participated in collective vision board planning, assessed self-love and acceptance, explored their gifts, talents and strengths, defined for themselves what a winning life looks like and committed to taking at least one long-term action step toward embarking upon it. To Learn more about this program, visit empoweredUth.com. For a visual recap, click here. With limited programming scheduled the remainder of 2018, we are going to reflect on what this year brought. Here's a recap, so please take a journey down memory lane with these mentions and join us in giving thanks. Thank you for making it possible for us to do what we do. 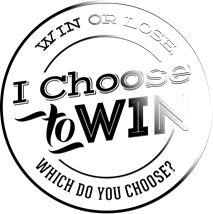 Learn more ichoosetowin.org. To God be the glory in all we do! And are! Thank you to all who joined us and helped to raise funds for 2018 programming at our 3-year anniversary soiree held at Stratus Lounge. What a blessing it is to witness what God has done with I Choose To Win over the years. 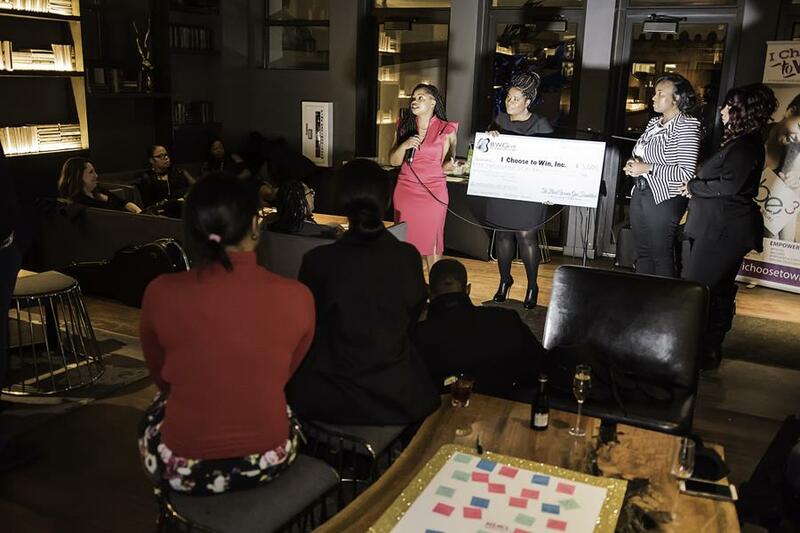 At our 3-year anniversary soiree, we thanked the newly formed foundation Black Women Give for naming I Choose To Win the inaugural grant recipient for Empowered Uth Learn more. What an honor! Make a Pledge. Donate Today! I never heard of Legacy of Love Foundation until Stephanie Ford, Get Cha Mind Right, shared their organization with me. Incredibly, a few short months later, I Choose To Win received a grant from that very same organization. But, since learning of their mission, we want to help champion their cause. Please check out Legacy of Love and support them, if possible. I am in awe of the giving community in Philadelphia. What a Legacy! LOVE. Legacy of Love: Annual Meeting! Legacy of Love Foundation, Inc. held its annual impact meeting on Tuesday, June 26, 2018 where invited guests; scholarship recipients and community grant awardees, including I Choose To Win, were in attendance learning the impact, vision and mission for the philanthropic organization. With gratitude, we thank our volunteers, board members, program participants and family for being in attendance and bearing witness as recipients of this gift. 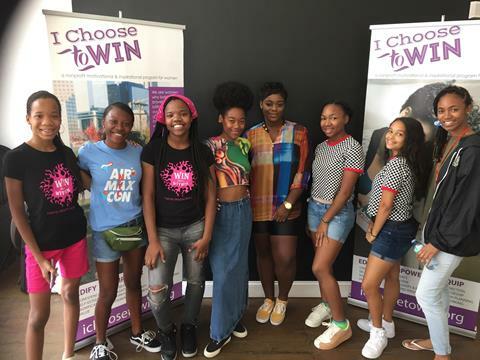 I Choose To Win held its “I’m Ready To Choose” conference for women in periods of life transition, preparing to make a decision in favor of victorious living. At the Fort Washington venue, event organizers, presenters and facilitators were joined by the women who registered, showed up and stated they were ready! Ready to uncover their issues, unveil their truths, unleash their gifts, to unlock their God-given potential. Students who expressed interest in either clothing design or the singing as a form of self expression were enamored by our guests, designer KaDiedra Simone and entertainer Seraiah as they shared their stories of following their dreams. Mommy & Me: Cupcakes and Tea! It was a most elaborate high tea, organizers spared no detail - gorgeous event. In a reversal of roles, the girls shared attention, affection and affirmations with their moms. We were invited by You're Beautifully Made and GLC House of Hope, incredible organizations focused on young women. Click to read more. New Music! Listen for free: Visions of Me. 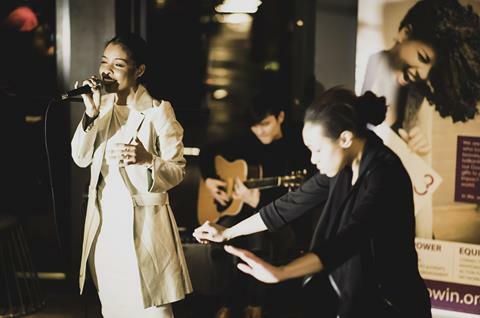 By way of our Explore U: Song Writing Workshop, this collaboration between novice song writer, Melonie Butler, and songstress Shanae Tizon of Beat Peace, who brought to life Visions of Me: a song that gives a glimpse of a person overcoming personal struggles to find freedom in her authentic self. Click to listen. 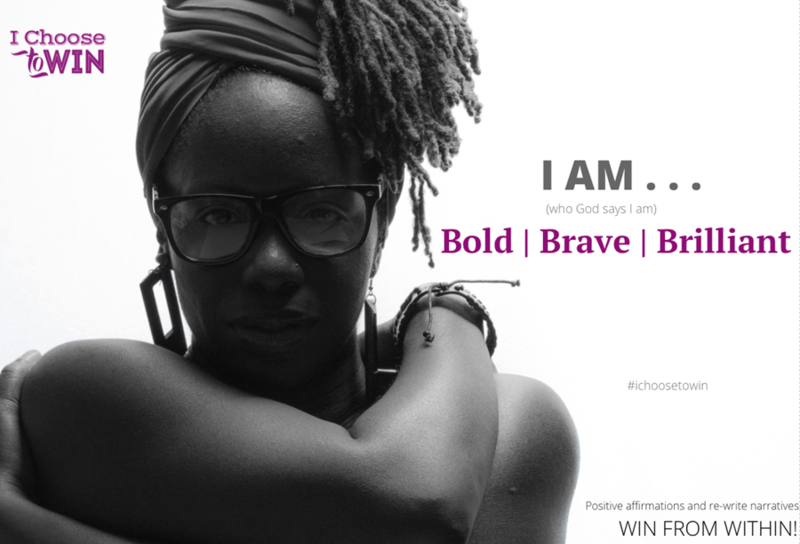 The founder of I Choose To Win shares pivotal moments in her life's journey that awakened her to God's voice and prompted her to exercise the power to choose victory while facing spiritual battles. Click to get your own copy of this compilation of reflections, photos and poetry. Visit: Timetochoosebook.com A percentage of book sales support us. Preordered books will be mailed this week. Thank you D-Hive for hosting. Workshop led by Melonie Butler to discuss leadership beyond college! Click to read more and see pics. Thank you Penn State Abington! Climb higher. Shine brighter. Reach back. Click to read more. 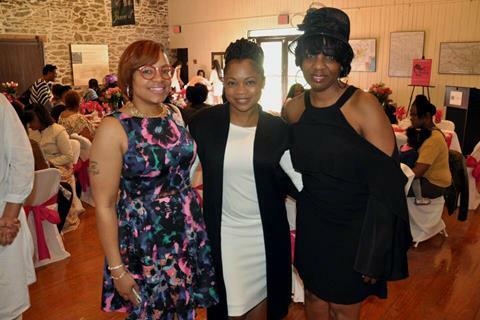 Women on mission to edify a generation of women. Thank you DivaGirl Philly! Workshop led by a professional photographer, Nikki Lenore, a small group of women seeking to explore a different side of themselves in 2018 embarked upon a photo shoot reflecting the narrative of who they believe they are by God's design. It was so much fun! Click the image below to check out the video, then choose to join us for the next set of workshops scheduled for 2018. 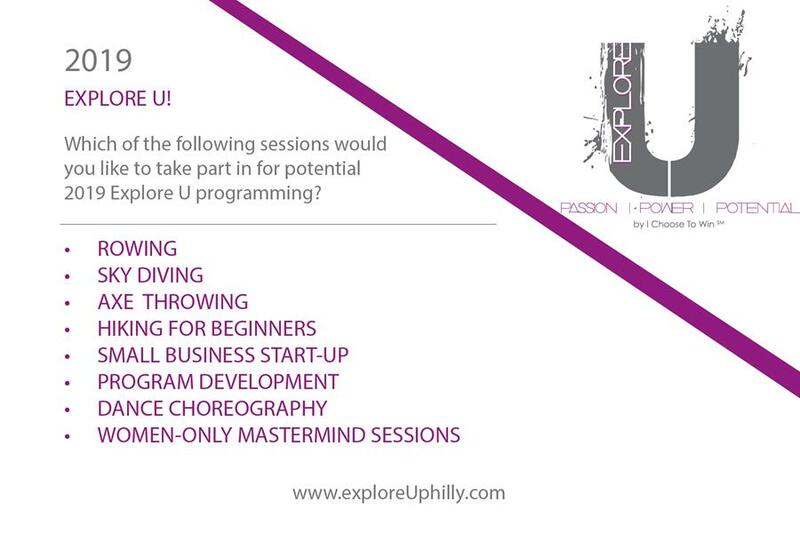 Learn more at exploreUphilly.com. Bold Intentions: Gearing up for 2018! 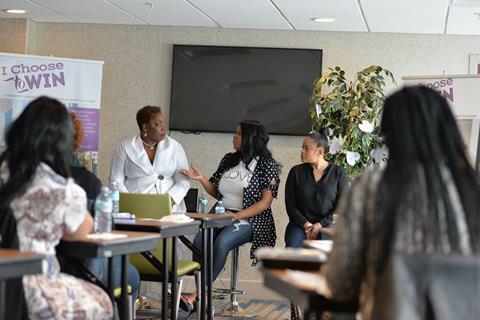 A small group of women shared their own personal obstacles that held them back from embarking upon their own vision of success. Then, we agreed to make a bold intention: Read on. We give God the glory for the lives we lead & the impact we have when we understand that in HIM, we are enough, significant and powerful. In life, we are women who win! "I Choose To Win" is a mission statement that doubles as a positive movement. We want women to walk in purpose, pursue their passions, harness their power to realize their potential. If you like what we stand for, like us on facebook. 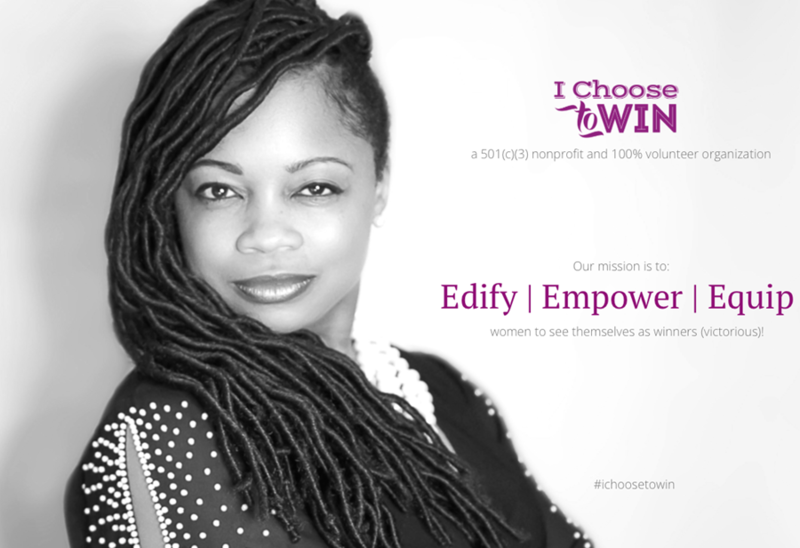 At I Choose To Win, we edify, empower and equip women to live boldly, bravely and brilliantly. We hope more women choose to unleash their God-given gifts to impact the world and experience victory in daily living. As women (young and mature), we are evolving into the mothers, daughters, wives, friends, individuals, entrepreneurs, community leaders, employees, educators, social activists, advocates, lawyers, artists, creatives, professionals and so much more - that we are by God's design. We are grateful to those who have supported this organization to make it what it is today! Join us on mission. Thank you in advance. If you are interesting in supporting the Empowered Uth, Explore U, I Choose To Win TV programming and message development, please join our team. We have an increased need for volunteer or college credit-interns with the following skills: Videography, Adobe Creative Suite, Writing, Content Development and Management and Personalities. We also need donations of space to significantly reduce costs for programming. Click here to apply. Thank you for your ongoing support. May God's continued blessings be upon us, His purpose fulfilled through each of us and His will be done in our lives!